More information and pictures to come, but we wanted to get this new sculpture onto the the website. This cat can be a Panther or a Cougar depending on your needs. The anatomy of both animals is identical. As you can see in the pictures we can vary the patina color as well. You can buy the statue by itself and display it on your own pedestal or natural rock, or we can provide a bronze rock as shown in the pictures. The measurements of just the panther/cougar are 7 feet long x 31" tall x 26" wide at the shoulders. 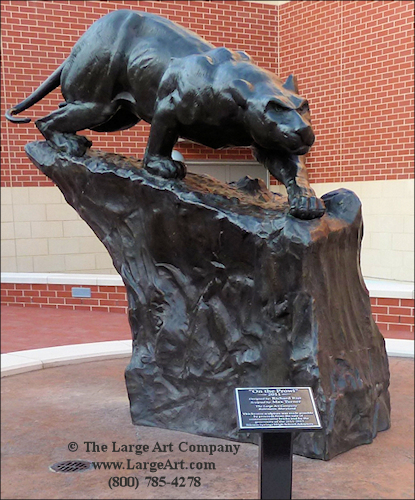 The panther / cougar on the bronze rock measure 7 feet x 74" tall x 48" wide at the widest part of the rock. Please call for ordering.